Home » Articles » How to Undelete lost Photos Easily? If your photos have been accidentally formatted, don't be panic. Formatting a partition only erases the address table, not the data itself, so there is still a chance to do photo recovery from formatted partition with easy photo recovery software. Many people who have little knowledge about computer may be confused about the reason. When the photos are deleted, it seems that these photos disappear from your computer permanently. Actually, their contents aren't immediately destroyed. Windows simply marks the hard drive space as being available for use by changing one character in the file table so that the file entry won't be displayed in My Computer or a command line. 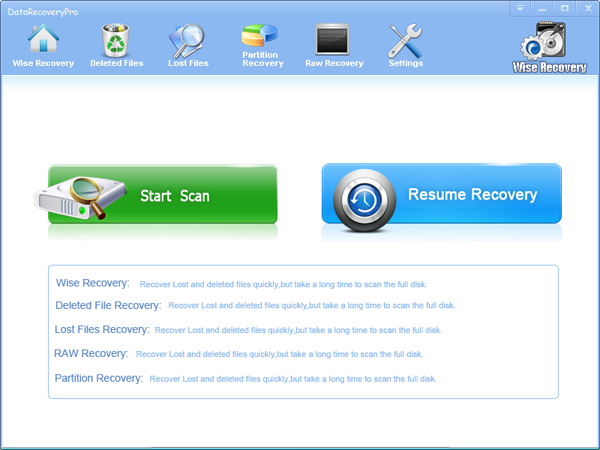 WiseRecovery has succeeded to find a way to locate the data so that the photos can be recovered easily. Download WiseRecovery Software, install it and launch it. Click the "Start Scan" button on the main window of Data WiseRecovery.